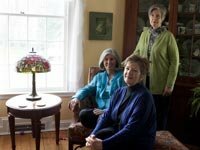 Among the creative housing options for people 50-plus or any age: Sharing a house with good friends. Here, adapted from Baker’s book (pictured below), is a brief guide to what some of these creative options are called and how they work. Karen Bush, Jean McQuillin and Louise Machinist are housemates. Read their story via the first link below. The Benefits of "Better Living Design"
Unlike a commune (famously personified by 1960s-70s era hippies and flower children), cohousing arrangements rarely come with a political or cause-directed agenda and they do not involve a shared ownership of property. In a cohousing situation each person or family purchases a residence — be it an apartment, townhouse or even a single-family house — which contains everything a typical home would have (i.e., a kitchen, bathroom, bedroom and living room). However, the residences are linked to a shared space, such as a yard and gardens, and a large common room, dining area and kitchen that can accommodate group meals or gatherings. The point of cohousing is community and being able to live independently without living entirely alone. Cohousing setups are typically intergenerational and don’t involve staff-provided services, but they can be age-specific. A few “senior cohousing communities” have been built, and some allow residents to hire household and care services as needed. In these arrangements a person who has a home may invite a friend or family member, or even a tenant, to move in and help with expenses and chores. The setup might involve people of the same age or generation and the arrangement is one of peers residing together for companionship and cost efficiency. Sometimes two or more friends actually purchase or rent a residence together and become housemates. Another house sharing scenario can revolve around the needs of an elderly property owner who doesn't want to relocate but can no longer care for herself or a large home entirely on her own. A younger person (and younger can even mean someone who's 60 or older) may be willing to provide some caregiving and transportation assistance in exchange for affordable or flexible housing. If so, the two can make for well-matched housemates. These types of member-owned, resident-governed nonprofit communities are common in certain cities (New York for one) and are generally not age-specific. A co-op can be made up of housing that ranges from apartments to single-family houses to mobile homes. The co-op board, typically consisting of elected residents, decides what shared services the co-op will provide (such as social activities and maintaining the grounds) and often has approval rights over potential home buyers. Mobile home cooperatives are spreading in rural areas, and senior housing cooperatives have taken root, particularly in the Midwest. A “niche” or “affinity” retirement community is one where residents share a common interest, religion or identity. The link may revolve around, for example, shared ethnicity, sexual orientation, occupation, hobby. Founded in the Beacon Hill neighborhood of Boston in 2002, the Village model of “neighbors-helping-neighbors” provides a way for older adults to stay in their homes and community. There are upwards of 125 Village communities throughout the nation today, with 100 more getting started, most operating via a mix of paid staff and volunteers who assist older residents with everything from transportation and technology training to home repairs and grocery shopping. Villages frequently provide social activities and classes as well. Members pay annual dues and are encouraged to volunteer themselves. In "With a Little Help From Our Friends" author Beth Baker examines living arrangements that allow people to have both independence and community as they grow older. Generations of Hope Development Corps.